Viofo are a Chinese dash cam manufacturer that have had tremendous successes with their A119 and A119S models. Now they’ve released a relatively low-cost dual channel dash cam, aptly named A129 Duo. Let’s have a look if this device has the potential to become as popular as the single-channel models. Outwardly, Viofo have kept to their trademark wedge shape. This is a popular form factor for dashboard cameras, as it makes for a stealthy and unobtrusive design. Gone are the days of a huge suction cup mount sticking out like a sore thumb from the windshield. Build quality is good, and the layout of control buttons has been rearranged for the A129. There are five buttons, lined up in a row: Menu, Record, Lock File (a bit larger than the others), followed by Mute, and Picture-In-Picture (PIP) keys. Three LEDs indicate recording, Wi-Fi, and microphone statuses. Long-pressing the Menu button turns the camera on or off (power button), and long-pressing the PIP button serves to toggle Wi-Fi. While the rear camera looks the same as the Aukey DR02‘s, that’s only its external appearance. The hardware used inside is totally different. For example, the Viofo A129 Duo is the first dash cam that uses a SONY STARVIS IMX291 sensor for the rear camera. In fact, the front and rear cameras actually use identical sensors and lenses. Most other dash cams use inferior hardware for the rear camera. 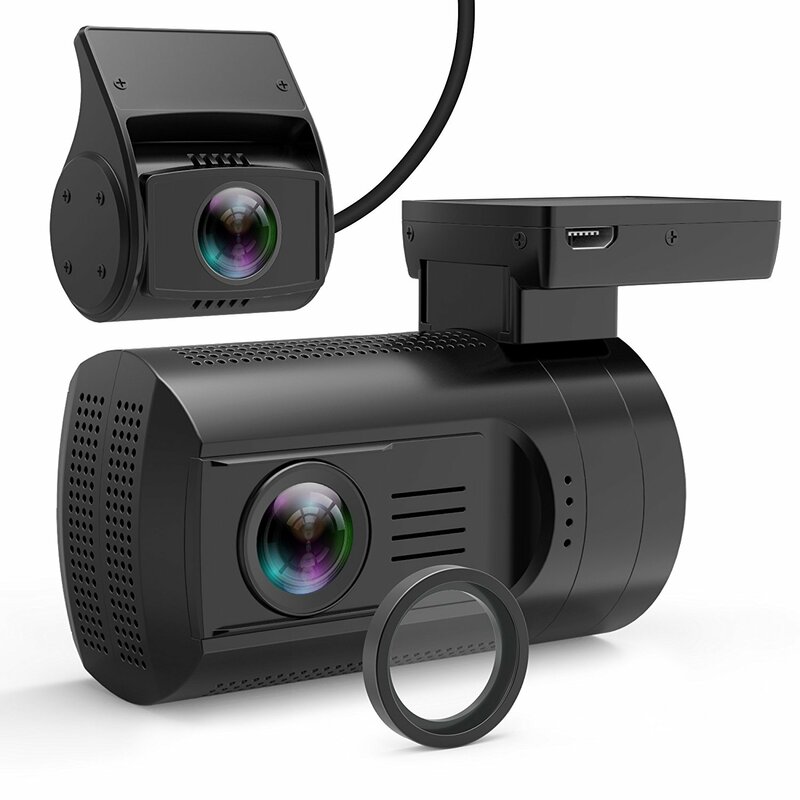 As for the quality of video footage it records, the A129 Duo performs about the same as other two-way dash cams in its price range. While its video isn’t as sharp as what high-end dash cams like those by BlackVue and Street Guardian produce, the A129 records better video at night than most other dual dash cams below $250. At day, the A129’s video quality is good to very good. Check here for an overview table detailing the video performance of various front and rear dash cams, at day and at night. Bit rates are 16.5 Mbps for both the front and rear video streams. A 128 GB card will give you a little more than 8 hours of uninterrupted recording time. The maximum supported card size is 256 GB. If you purchase a hard-wire kit (also available separately) and hook the camera up to the car’s fuse box, you have several options for recording while the car is parked. One option is time-lapse recording, and the other is to record at a lower bit rate (reducing video quality). If an event is detected by the camera’s G-sensor or by visual motion detection, the A129 will wake up and start to record normally. At the moment though, wake-up time is around 4 or 5 seconds, during which nothing will be recorded. While this issue will hopefully be resolved in the future, for the time being you may want to consult our list of the best dash cams for parking mode if parking surveillance is important to you. Buffered (“true”) parking mode is not supported. A GPS receiver is built into the mount of the camera (which is actually more of a bracket that sticks directly to your windshield, and this highly discreet). While GPS is labelled as optional, at this time we have only seen a GPS version of this camera offered for sale. A CPL filter is available separately for this camera, to reduce reflections. The A129 supports Wi-Fi, either at 2.4 or at 5GHz. Free apps are available for Android and iOS smart phones. There seems to be an issue with the camera’s Wi-Fi currently. If your phone connects to the A129’s access point but doesn’t seem to connect to the camera, you’ll need to turn off your phone’s mobile data. Viofo also point out that this camera supports Bluetooth, for an optional remote “lock file” button that’s yet to be released. When this is ready, the A129 Duo will be one of the first dash cams to feature a remote lock file button. UPDATE: The remote lock file button is now available. It costs around $20 and comes with two batteries (one of them is a replacement for when the first one runs out). You can just place the button within easy reach, and push it whenever something happens that you’d like to keep the video of. While this looks like a good and reliable dual dash cam in the sub-$200 price range, there are still some childhood issues with Wi-Fi and parking mode to be sorted out. We will update this review if these are fixed in the future. Seeing the immense success of the A119 series, the A129 Duo does have the potential to become a major best seller if and when its quirks are corrected. Forward video at day looks very good. License plates of other cars are easy to read even while driving by at some distance. Day rear video quality is good. License plates of nearby cars are easily readable by pausing the video. Forward video at night is good. License plates are mostly readable, albeit sometimes washed out by our own headlights, or blurry when the viewing angle is inconvenient. Rear video at night is fair. Other cars’ license plates are readable when driving by slowly, but are blurry at higher speeds.